Over the years, companies have invested billions of dollars building their supply chain infrastructures and processes. And while most manufacturers, retailers and logistics providers have adopted some type of supply chain management system, complete data integration and process automation remains a challenge. Users continue to manually copy and paste data between disparate systems and portals for supplier communication and information exchange on a daily basis. These manual, repetitive tasks are highly inefficient, slowing your operations and tying up valuable resources needed to launch new products and services. 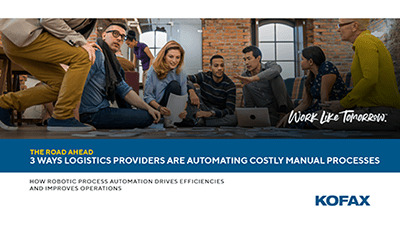 Kofax RPA for supply chain automation enables you to eliminate slow, costly and error-prone manual processes and improve your operations with robotic process automation (RPA). Automate B2B processes across both internal and external portals to bridge the gap with your suppliers and partners. Leverage enhanced information exchange and supplier interactions to increase efficiencies, business agility and customer satisfaction. Deploy robotic process automation as a cost-effective alternative to expensive integration approaches like EDI. 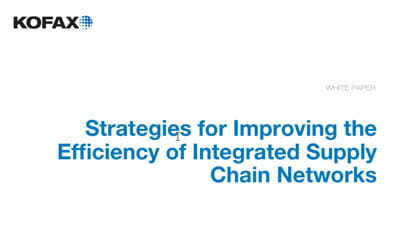 Enable tighter integration of all stakeholders in the supply chain to improve communication. Eliminate time-consuming manual tasks for order processing and customer service as well as for gathering data on product demand, marketing, sales trends, pricing and logistics. Standardize your business processes and data exchange with partners for greater efficiency. Enhance responsiveness with business suppliers and partners through improved data integration and cost-saving automation. Deploy supply chain automation and integration in days, not months—all without any complex coding—and ensure data accuracy throughout the order lifecycle. Collect valuable data on your on-going operations as well as supplier interactions via social media, mobile and online communications. Monitor and adjust to market/competitive conditions to increase profits by quickly extracting and integrating internal and external data. Automate manual data-driven activities that standard integration tools do not address—and where traditional BPM systems are too cost prohibitive and time-consuming to implement. Eliminate all remaining manual data exchange activities that exist today and extend the value of your existing supply chain and logistics management systems.